Opscode Summit day one has passed. I had to skip the sponsored dinner tonight, so for others it might still be going on. While there were lot’s of great sessions going on, and a great variety of people (seemed like 100+ in attendance), one thing stood out to me: The Chef community is awesome. To be fair, there are many great tech communities but the advantage the chef community has, and devops culture in general, is how many different skill sets are necessarily brought together combined with a culture of friendliness. Networking gurus, SysAdmin fanatics and passionate Devs are all brought together to solve some of the toughest challenges in modern computing infrastructures. The benefits from this variety of experiences are immediately evident with everyone brought to the same table, each one sharing their unique perspectives and experience. With so much to learn it’s great there’s so many experienced, friendly people to learn from. 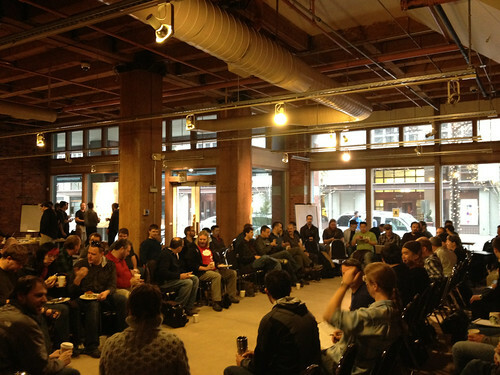 The Community Summit is structured in an Open Space unconference style, which is a refreshing change from the usual conference agenda approach. After a brief introduction attendees gathered to discuss the topics and sessions that would be discussed throughout the day. 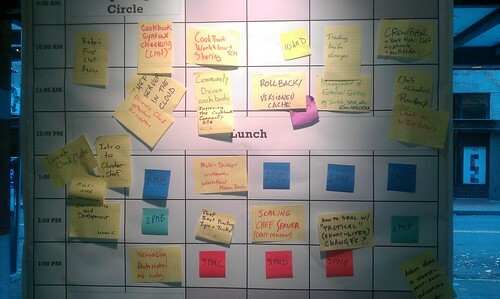 The resulting agenda board is pictured at right. This fosters a relaxed, self-learner friendly style of participation, which I felt lowered the social barrier for participation within the groups. Personally I was able to attend the discussions on Cookbook syntax checking ‘Lint’ style, Management of External Entities, Documentation improvements, How to handle “tactical” or short-lived changes and the ‘Choose-your-own-adventure’ style talk by Adam Jacob. I’m looking forward to the sessions tomorrow.